Well, that was certainly a way to end a season. After Quantico spent twenty-one episodes leading up to the terrorist and his plot, we not only got the reveal of the plan (in the dramatic fashion that only a villain could deliver), but also an emotional death, and a potentially new chapter for Alex Parrish's career. What did Mer and I think of "Yes"? You're about to find out! What did you think of the reveal of Liam as the terrorist? Were his motivation something that seemed reasonable? Mer: We thought Liam was shady all season (I think you more than me, but I do specifically remember mentioning it a few times). So Liam as the terrorist in and of itself wasn’t super surprising. As for his motivation... well, that left a bit to be desired. It was a stretch, but another thing I’ve said all season is that this show requires a certain amount of suspension of disbelief. This was one of those times. Liam as shady and bad and just all around up to no good makes total sense, so I’m willing to give some leeway on the motivation piece. Jenn: Oh yes, I definitely thought from the beginning that he was sketchy. It wasn’t until a little later in the season though that I was more convinced that he was the terrorist and not one of the NATs. And while I’m immensely glad that Quantico managed to address the terrorist issue and not drag this on for another season, I’m not feeling Liam’s motivations at all. You can tell that they tried to make him more diabolical (and he was already sketchy to begin with, show!) and it just didn’t work for me. That insanely long opening montage chronicling exactly how Liam was the terrorist was just so cumbersome. Overall, while I like the fact that the show took a risk in committing to one person, ultimately it just didn’t feel earned. Did Simon’s ultimate sacrifice feel earned and significant? Mer: Yes! Oh my, this was the most poignant and heartfelt and emotional part of the episode — nay, the season — for me. I am going to miss Simon (and Tate Ellington) so darn much, but boy did I feel the impact of this. Out of all the characters, Simon was the one whose motivations and connection to his goals always felt true to me. He felt responsible, and his entire arc had been about struggling with what the right thing was. And in the end, he died doing what was most important to him — the noble, right thing. Man, I cried real, snotty tears during that whole sequence and his funeral. Jenn: Oh gosh, I sobbed too, Mer. I had no expectations of going into the episode with any sort of emotional attachment but it’s hard to deny the fact that the Alex/Simon relationship was one of the strongest of the series. Heck, I liked it better than any of Alex’s romantic forays. So that final conversation where the group keeps him on the line as he drives into the river was just so heartbreaking. And Alex telling him that she loves him was just the thing to make me sob. The last time we really delved into Simon’s psyche before this episode, he was feeling immense guilt for the lives he’d cost. And yeah, this sacrifice was, in part, atoning for the wrongs. But on a larger scale, this was just proof that for all of Quantico’s waffling on whether or not Simon was good or evil during the beginning of the series, he really was a hero with morals and values. He was a good person who wanted to live a good life, and struggled with that. Raina’s relationship with him felt immensely organic and totally earned. The sacrifice he made was so important, and man did Tate Ellington absolutely sell that scene or what? You could feel everything he did, from fear to happiness and even his little joke to Raina about getting tea. Simon was a great character and I’ll miss him a lot. The show managed to fracture a lot of relationships in the flashbacks and restore them in the present-day (Booth/Alex, Caleb/Shelby, Alex/Shelby, Raina/Nimah, etc.). Let’s discuss how the major pairings and relationships were restored and whether or not we liked the end result. Mer: Okay, let’s discuss. First up, Booth and Alex. Sigh. I ship them, I guess? I did early on, but all the yo-yoing (which was not helped by the flashback/present day back and forth, because it made the relationship drama almost feel double) got to me. In the end it felt a bit too... neat and tidy to have them find their way back together so soon. It makes me a bit concerned that there’s just going to be so much will they/won’t they back and forth with these two throughout the series, and it’s already feeling a bit tired and stale. But the chemistry is there, so I’m a bit unsure where I stand with my feelings on them now. I’m thrilled the Golden Retrievers are finding their way back together. This one doesn’t feel as rushed or superficial, and I hope they spend a bit more time really rebuilding their relationship. I like it. The same holds true with Alex/Shelby. The female friendships on this show are great when the appropriate attention is paid to them, and this is one example of that relationship. I like it, I think it’s a solid and important part of the show, and I also hope to see more of these two coming back together as friends and colleagues and a support system for the other. Of course, the twins mending their fences hits me right in the feels. 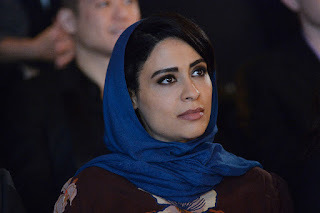 Other than Tate Ellington, Yasmine Al Masri as Raina and Nimah is, in my opinion, the strongest actor on the show, and she truly made me care about the twins’ storylines (together and separately). Raina and Simon’s relationship always intrigued me, and the way Al Masri played each twin as such a distinct individual rivals Tatiana Maslany playing 72 million clones on Orphan Black. I want to see more of the twins next season, too. Jenn: I’m so done with Booth/Alex, honestly. Booth became the most annoying and horrible character for me in the present-day (and he wasn’t much better in the flashbacks). And for me, the will-they-won’t-they this time around really lacked tension. I mean, Alex pretty much even said it in the flashbacks — they know the song and dance already and how things will end. If the characters are making those kinds of comments about their romance, and seem bored about doing the same thing every time they have a fight, how am I supposed to care about their relationship? I agree with you, Mer, that their end seemed too neat and tidy for Quantico and for this strained relationship. On the flip side, I think what the show is doing with the Golden Retrievers is really great. Theirs is the kind of rocky love story that wasn’t wrapped up in a bow, and was just proof that they have a long way to go but still love each other. Shelby’s little comment to Caleb about loving watching him work was a nice open door for their future. I’ve always liked that Quantico doesn’t tear down female friendships for the sake of love triangles. Though love triangles are totally a thing that happens in this show because of its soapy nature, I like that the Alex and Shelby relationship had real weight and real consequences and real substance to their arguments. That said, I’m really glad that the two are a team again in the present-day. And I have to say, even if it was unintentional, I like that as the show progressed and Shelby’s stories got a bit darker, her whole look got darker and more severe too (especially her eye makeup). Okay, now having mentioned that, I also have to admit that I really hate Shelby’s way-too-dark eye makeup. Mer, I totally agree with you about Yasmine Al Masri. I forget every episode that she’s not a twin and that she’s doing both parts. That was my favorite reveal in the pilot episode, and I think she’s done an incredible job of making each twin distinct. You can tell when it’s Nimah saying something and you can tell when it’s Raina. Ugh, and poor sweet Raina who is now dealing with Simon’s death. I loved their relationship because it always seemed so simple and both characters were just so HAPPY together. Al Masri has done an incredible job of making me forget that she’s both Nimah and Raina each week. I really am happy the twins reconciled because it just doesn’t seem right if they’re not on the same team. And Raina will need her sister now for emotional support more than ever. Quantico has a habit of leaving a lot of plot threads dangling, and the finale featured more of those, including Claire’s involvement and the rest of the team members’ post-funeral lives. Is there something they left dangling that you’re itching to know more about? Mer: I am intrigued by the direction of the Claire storyline. But other than that, I felt they really wrapped things up well (maybe they were worried about renewal?) I mean, really, my only burning question is what the heck happened to Iris? She is totally missing from the present day. Oh, and, is there some crazy only-on-TV way they can make Simon not actually dead? Please? I’ll take any suspension of disbelief with this one. Jenn: That’s true, Mer. I didn’t think about their uncertainty of renewal. In that way, I think the show did a good job of propping open a door for the second season. I just don’t know how much story there is left to mine with Claire. Marcia Cross is fantastic, but I liked Claire Haas best as the unhinged mother trying to save her son. This whole co-conspirator, political agenda-driven woman feels an awful lot like every other ABC show villain in Shondaland. So, meh. If we never see Claire again, I’ll be totally okay. I AM really interested in how the show will be structured next season since we’ve wrapped up the NATs flashbacks at Quantico. Is this going to be like Arrow where we keep shoehorning them in each week even when they annoy us? I have to say that Quantico did a fairly decent job for its first season of balancing the past and present-day stories, so it’ll be interesting to see what format season two takes. 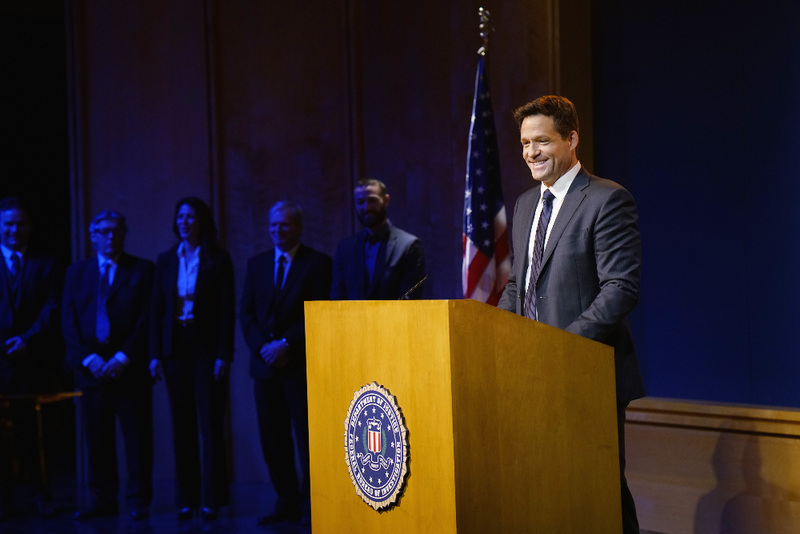 The season ends with Alex potentially accepting a job with the CIA. What did you think about the end of the finale? Do you think she’ll accept it? Mer: This is interesting. I mean, the show needs Alex doing something spy-esque for the show’s premise to work, right? But CIA is sort of the opposite of Quantico/FBI, so I’m not sure how it’s going to work. It’s a nice set-up if nothing else, I suppose. Overall, I felt the finale was really, really strong, but if there was one weakness it was that very last scene. It just felt a bit like a necessary add-on, and not something that really works. I mean, Alex’s own argument was that she can’t be FBI because she’s too well-known. So, she goes to the CIA? An even more covert agency? This is going to take some creative footwork to make sense to me. Jenn: I think that the show did right in making all of the emotional stuff the focus and leaving us with a kind of whimper, not a bang, in the final few moments. I do like that we’ve been introduced to the idea that the FBI/Quantico and the CIA are polar opposites. But I agree with you wholeheartedly about the final scene too, Mer in that it was pretty tacked-on. Also I’ve kind of been a little burnt out on the “Alex Parrish is so great, everyone needs and wants her” stories this season. She’s a great character but when she’s always right or always saving the day or always being recruited by top-secret agencies, I just feel a little tired of that. You know? Looking back on the season as a whole, what do you think was the show’s greatest strength? What is its greatest weakness? Can the show improve on its weaknesses in the upcoming year? Mer: The greatest strengths were the fun plot twists, and the character dynamics. 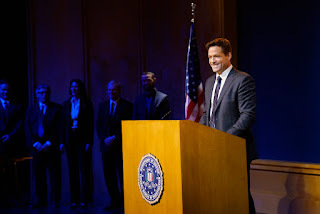 The entire cast has a fantastic chemistry, which definitely pushes the show forward. And really the show is just fun. Super fun. You can’t take it too seriously, but it’s mostly entertaining and enjoyable. On the other hand, the weakness in my opinion is the sometimes overacting of some of the key players. And the back-and-forth relationship drama. I am the biggest shipper ever. I love a good romance. But Ryan/Alex just felt overdone, already, and it’s only the first season! The show needs to find a bit of a better balance between the action/suspense and the drama. I definitely think it can, though. It’s off to a really solid start, and I feel confident it can find a more solid footing and balance. Jenn: Quantico’s pilot was my favorite out of the 2015-2016 television season, and somehow the show fell into some traps around midseason. I think that when a premise is based on a mystery or a lie a character tells, things get pretty old pretty quickly. It was really fun when the show explored a different NAT suspect each week, but that was only going to last for so long. And then they brought in MORE NATs, and the format started to take a tumble a little. I think for me it was the fracture of the core NATs that made the show slip in quality to me. The stories felt more forced, drama-wise and with Alex, the twins, Shelby, Caleb, Simon, and Booth all fighting, it led to a really disjointed flashback season. What’s really great about this show when it’s at its best though is that it goes for broke and balances drama and romance and comedy really well. Episodes that feature the NAT team working together function so well because that’s the core of the show. I think the series lost that a bit this year in muddied romances and too many conspiracies, but I think it’s on a good track to bring itself either back up or further down this coming year. Who was your favorite character at the beginning of the series? Has it changed since? Mer: I have to go back and check my early reviews! The twins and Simon have always been on my radar, and that stayed pretty consistent. I would say the character who grew on me the most was Caleb. He had so much character growth, and Graham Rogers played him so well, that I went from feeling really meh about him, to really caring. Shout-out to Will — he joined later, and really didn’t get a ton of screen time, but he was unique and interesting and I enjoyed him on screen. I was thrilled to see him pop up in the finale for a bit. Jenn: Simon was totally my favorite character in the pilot, but I agree that Caleb is definitely my favorite as the first season ends. I began to hate Alex and Booth this year (which is not what you want), and Shelby’s persistent anger at Caleb wore on my nerves after a few episodes (and I loved Shelby in the pilot and didn’t care for Caleb — how the tables have turned!). I have to say, I really liked Iris and Will’s brief partnership (their storyline about the NATs getting through airport security was the best one). I will not miss Drew or Liam at all. Sorry boys. Mer: WHERE IS IRIS? Really, show, this is a bit of a ball drop. Also - this is super nitpicky of me, but Simon was a fairly observant Jew. Are there no Jewish writers on Quantico? Or did they not do their research? At Simon’s funeral Raina mentions that he has one medal with him and she wants to put the other in his casket. But Jews are not allowed to be buried with anything; it’s strictly forbidden. So that bugged me a bit. Other than that, the finale was by far the strongest episode of the season. What a way to end! I am going to miss Simon/Tate so much, he was absolutely the MVP of the season (and may be my MVP for our TV MVP installment this week!) Kudos, Quantico, for a solid first season! I’m looking forward to what comes next. Jenn: No but seriously, the new mystery of this show now is where Iris is. DOES NO ONE CHECK IN WITH HER? I guess she didn’t know Simon to be at his funeral but still. WHERE IN THE WORLD IS SHE? Uh, did we know Miranda’s son died? We assumed something bad eventually did happen to him but the show literally made zero mention of his fate up until the finale, which seemed so odd to me to throw in there. Also Liam’s daughter was a weird and random addition to the finale. The greatest mystery of Quantico is still this: how does Alex Parrish’s hair look so flawless all the time? 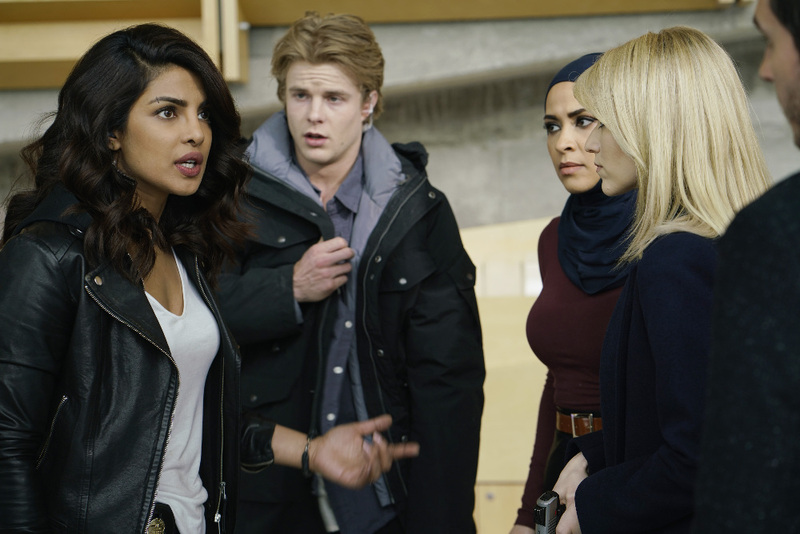 We hope you enjoyed this season of Quantico! Check back next year for more of our discussions, and hit up the comments below with your thoughts on the finale.